She said she had been raped. SHE LIED. I said it didn't matter. I LIED. They said it would be over real quick. THEY LIED. 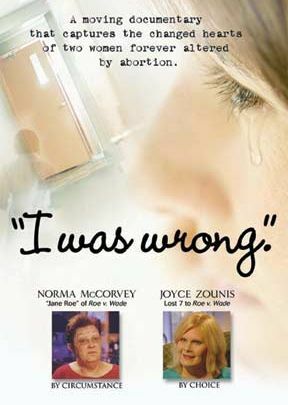 She. . .is Norma McCorvey, 'Jane Roe' of (click) Roe v. Wade. She never had an abortion, but her U.S. Supreme Court case brought abortion-on-demand to America. Darkness and disillusionment plague her life with baby parts, alcohol, drugs and suicidal attempts. I. . .am Joyce Zounis. My choice of abortion, not once but seven times, nearly cost me my life. Tormented by disbelief, I live in a nightmare of anger, guilt and disconnection. I grieve not only for my seven children but also for the heritage of their children. They. . .are the pro-abortion movement.
. . ."the most powerful thing I have ever seen. Things don't often bring tears to my eyes but this definitely did. Amazing! I have heard of post abortion trauma from my trips to a pregnancy center in Uganda and from two other center directors. But hearing it and seeing the video were two different things. I had no concept of what it all meant until today. . . I am still amazed. " (Click) here for more reviews. from the Internet to Broadcasting and Beyond. . .
we are ready to go above and beyond. Comments, story ideas, and suggestions are welcome. Click here to submit a review today. This website for beyond the bandaideTM of (click) other than a bandaide productions, llc is your one stop for broadcasts & events showcasing dynamic transformations from some of life's biggest messes. In focus today is our nation's biggest mess: abortion. Developing media projects, speaking engagements & video productions will headline tough questions advocating, liberating, celebrating & educating an unsuspecting public impacted by this American right. (click) Voices of TruthTM will be featuring stories of real life experiences with abortion; child loss through choice. As a woman who personally knows this mess all too well, I have found that it is possible to live beyond the bandaideTM placed on the mistakes of my past. It is my hope that regardless of how you feel about abortion, you will take the time to listen to what is said in the documentary and throughout this website and consider how abortion strikes at the heart of America. believe in them by giving audience to their experience. Surprisingly, forgiveness and telling my story have gotten rid of the most foul-smelling bandaides covering the secret sorrow of my heart and the infection of my soul. Hang in there - becoming an expressive treasure with valiant influence is beyond your bandaide. Yes, even when you have made the worst of mistakes. At the beyond choice link you can learn more about this forgiveness. And by clicking on the join us link you can share your story of child loss through choice or childhood sexual abuse and/or submit a review of the internationally released documentary "I was wrong." Our true to life link covers On The Air, In The Know, On The Hill, In The News and many other late-breaking activities and resources including upcoming speaking engagements for Voices of TruthTM. And (click) action alerts are also posted on this website inviting you to take action and be a voice of truth.